The first page of Joel C. Rosenberg's first thriller, The Last Jihad, put listeners inside the cockpit of a hijacked jet, coming in on a kamikaze attack into an American city...but it was written nine months before September 11, 2001. As Jihad unfolds, an American president finds himself in a war with Saddam Hussein over terrorism and weapons of mass destruction...but it was published five months before the actual war with Iraq began. Rosenberg's second novel, The Last Days, opens with the death of Yasser Arafat and an American president pressing for peace in the Middle East...but it was published thirteen months before the actual death of Yasser Arafat. 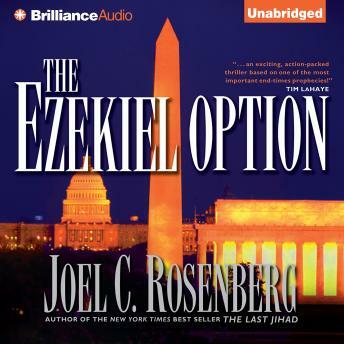 Now comes The Ezekiel Option, an explosive new political thriller that literally feels ripped from tomorrow's headlines. With Saddam Hussein and Yasser Arafat out of the way, a dazzling era of security and prosperity seems to have come to the Middle East. With the help of an American president trying to spread freedom and democracy, the Israelis and the Palestinians have signed a historic peace agreement. Violence is down. Their economies are booming. But a new evil looms on the horizon. A dictator is rising in Russia. Iran is feverishly building nuclear weapons. A new Axis of Evil is emerging, led by Moscow and Tehran. And Jon Bennett and Erin McCoy - two senior White House advisors - find themselves facing the most chilling question of their lives: Is the world rushing to the brink of an apocalypse prophesied more than 2,500 years ago?